Doing the same thing again and again expecting different results. Isn’t that the definition of crazy? Don’t you ever wonder about the confidence we have in technology and science? For example, have you ever made a decision based on all the information you had, felt really smart about it, but later learned there was a massive hole in your understanding that made all your genius wrong? Let’s get it straight right now: I’m not anti-science. I’m just in favor of pursuing scientific knowledge with a healthy portion of doubt and caution on the side. Maybe my lack of sophistication is showing, but I’m still pretty darn impressed with the feat of genetic engineering involved in grafting a fruit tree onto hardier roots. Even though according to this website, it seems to have been used as early as 5000 BC. “Agriculturalists are charmed. Naturalists are alarmed; ” proof that the more things change, the more they stay the same. Of course my work here raising these old-fashioned cattle probably seems kind of irrelevant and quaint to many people who focus on producing maximum output at all costs. Man is apparently wired to admire things that are complex in procedure and require lots of human tinkering. 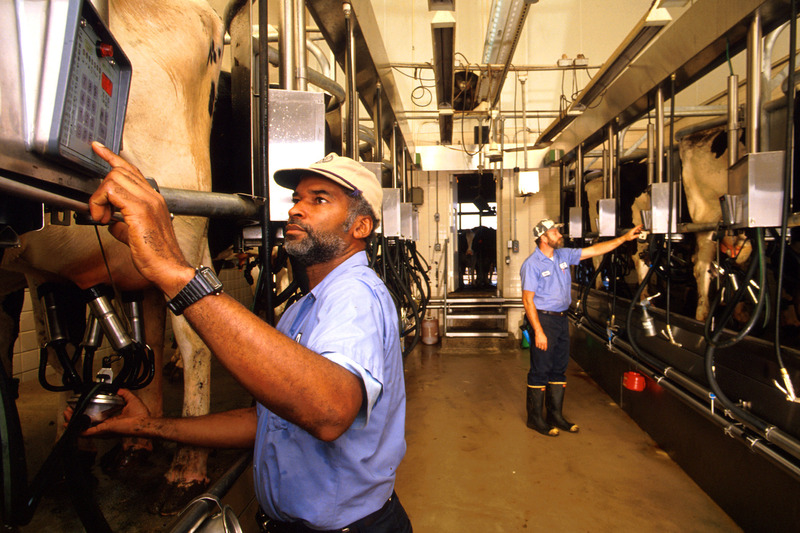 Like the breeding program at Fulper Farms, a NJ dairy featured in this NPR article. This is the story of Claudia, a very desirable (and lovely) Holstein dairy cow. The breeding goal of this farm is to replicate her until they have a farm full of Claudias. This is the way most modern dairies approach the problem of producing enough milk to pay the bills. Technological advances like artificial insemination and embryo transplant have made the rate at which humans can forever alter an entire breed of livestock scary-fast. In just a few generations, we can really make a lasting impact on a breed of livestock and it often takes several generations to know for sure if what you have achieved is good or bad. And by then, it’s usually too late to take it back. You see, we still don’t really understand how DNA is bundled. When you breed animals with a focus on one single desirable trait you’d like to increase, you’re at the same time amplifying several other unintended traits that are likely to be not so nice. And those traits are both physical and behavioral. Often times, since the animals are intended for food anyway, it doesn’t matter that they can’t reproduce on their own, if they have any parenting skills or if their skeletons and hearts are up to the task of supporting their massive, fast-growing bodies. Doesn’t matter, because these animals aren’t intended to live long enough to be healthy adults anyway. Which, while I don’t think it’s kind, I suppose the logic is sound. Other traits affect behavioral characteristics and create animals more difficult to handle, more nervous or aggressive. Intensely focused programs breeding animals for one trait can interrupt the social patterns relied on by many, many generations causing incidents of suffering and brutality caused by rogue individuals. I’m no scientist, but I am pretty observant. And the more I observe, the more apparent it becomes that there’s a rhythm and scale to things for a reason. Nature imposes a system of checks and balances that often seems harsh to us, but serves her purposes well. Fashions in animal breeding follow consumer demand for things like all white breast meat, low-fat pork, low-fat dairy and of course the ever-popular larger quantity for lower price. And, like that polyester pant suit, these demands are more likely to be created by companies steering us towards their higher profit choices than by what we actually prefer. Cows like Claudia serve this dairy well today, but if all cows were like Claudia, without the structured diet and care Claudia gets, her ability to produce huge quantities of milk quickly becomes a liability. The nutritional requirements to keep a high producing cow like Claudia healthy and fertile even when she’s not producing milk are not easy to meet in a simpler, less manipulated environment. So, my question is this: Is high production more important than profitability? If you think it’s painful filling your gas tank each week, imagine being a farmer. I’m not sure people are aware how reliant conventional farming is on petroleum. Petroleum is needed to manufacture the synthetic fertilizers conventional farms are so reliant on. Petroleum is needed to run the gas guzzling machinery needed to grow and harvest the large quantities of grain these cows require. And energy is needed to manage the tons of manure produced by too many cows for their farms to handle. Not to mention the energy requirements of milking and transporting milk. Please don’t take this as a slam for farmers like Claudia’s owners, the Fulper family. I have nothing but admiration for what is an obviously well run dairy. It just seems apparent that by focusing only on this as the single approach to the problem of low profitability, we are eliminating diversity in all areas: genetic diversity of livestock & seedstock, rampant loss of biological diversity and economic diversity as well. A broader base of smaller, local dairy processors and a variety of applications for milk is needed to offset the market dominance of a small number of mega-processors. If a cow can eat more simply, be productive longer, require little to no veterinary care and be significantly less reliant on petroleum products, is that not also increasing profitability? If a dairy makes less milk but that milk is of the highest quality and costs significantly less to produce, are the numbers irrelevant because they lack enough zeroes to impress our Fortune 500 jaded minds? My old-fashioned cows could not be more self-sufficient. They harvest most of their own food, stay fat on very simple food we can grow ourselves, require almost zero veterinary care, thrive in simple facilities and remain productive members of the herd for four or more times longer than the typical Holstein dairy cow. And a dairy farm using cows like mine has not one top shelf product to sell, but two. Give us time and we’ll come up with even more. The beef from these cows isn’t an afterthought sold at auction barn prices. It’s a first-rate gourmet product adding a second income stream to broaden the farm’s security. And in these times of dairy volatility, having milk in more than one bucket sounds like an awfully good idea to me. If you listened to the NPR clip as well as read the story, you’ll notice that they clearly stated that despite the technological advances, the farm is less profitable than it was in the 50’s and 60’s when they had a fraction of the cows and did more by hand. WHAT? It’s true. Our industrial system of meat and dairy was productive and useful in its time. But all things run on a spectrum and that time seems to be waning. The system will be around huffing and wheezing for a long time, but shouldn’t we be working on a backup plan? < Previous Pink Slime is not my problem. And it doesn’t have to be yours either. This concept was first introduced to me by Dr. Temple Grandin. Rings true in a scary way. I didn’t (listen), but I wonder how much of the “less profitable” problem is simply because the prices farmers are paid have not increased proportionately. As the economy has changed, farm prices (until very recently) ranged from flat-lined to bottomed-out. Hard to be profitable in that situation, and for years we’ve been told to “get big or get out.” Getting big entails technology and specialization. Which doesn’t necessarily lead to more profitability. As a small farmer with several income streams/trickles, I have a hard time believing that milking 15-20 cows by hand would provide the same profitability that it did in the 50s and 60s. So it isn’t the “bigness” of the farm that makes it less profitable. It’s that inputs are so much more (especially when they choose technology) than they used to be, and the milk check is the same. Rambling. Thanks for blogging, and thanks for listening. Thanks for the comment, I enjoyed it. Dr. Gandin’s book Animals in Translation is what first got me focused on loss of diversity in livestock and our human love of rearranging nature’s furniture with all sorts of unexpected results. And I agree completely with your take on the “less profitable” problem and I in no way am arguing for a return to hand milking although it’s working just fine for our Amish neighbors. I think the profitability issue is a marketing/bureaucratic issue with no painless solution. Overall it’s wise to keep the diversity that used to exist when the dairies were more involved with marketing their own milk instead of everyone just giving it up to big processors. Then a family could make a decent living with 20 or 30 cows. I would not even attempt to sell fluid milk – it’s just not profitable enough for me to bother setting up the infrastructure and dealing with the red tape. Finding an alternative value added product like cheese or butter is the only way it would be worthwhile for me to milk my cows commercially. But there are farmers making a decent, albeit an unconventional living with as few as ten cows. And often, they are reliant upon heritage breeds or heritage crosses to make the numbers work. Marketing is my achilles’ heel. And my other heel is shackled by having to hold a town job. I enjoyed the discussion. Thanks again! Well, you’ve got a point there. But I look to people like Kurt Timmermeister http://www.hobbyfarms.com/farm-marketing-and-management/10-minutes-with-kurt-timmermeister.aspx and the Flack Family Farm in Vermont or listen to stories about artisan cheesemakers on Anne Saxelby’s show Cutting the Curd on Heritage Radio Network. There’s all sorts of odds & ends small farms fall into when they’re paying attention. I have tremendous respect for the work you and others do to keep these old breeds around and productive. I have to, and want to believe that the future of agriculture in this country rests on the viability of small, diverse farms. A vital part of that is keeping heritage breeds (as well as heirloom fruits and vegetables) around. Genetic diversity is a good thing! As for Claudia, she looks pretty happy and like she’s enjoying pretty luxurious digs, so that’s a good thing. Yes, I do. I know more and more people who are also willing. The more “pink slime” type news stories we hear, the more people will be clamoring to make changes. I buy 80% of our food directly from local farmers. I urge every one to experience the highest quality foods that money can buy. You will never be able to eat a Walmart-burger again. We consider the cost an investment in our health. Our family hasn’t had so much as a head cold in 4 years. To me that is worth any price. the items are more expensive. products like yogurt for half the cost.